It is only in recent years that Merle’s name has been resurrected and, like Bouguereau’s, been restored to its rightful place at the pinnacle of the nineteenth-century art historical canon. Between 1847 and 1881, Merle exhibited forty-eight pictures in sixteen Salons, many of them considered, in subject and style, rivals of the work of the celebrated French painter William-Adolphe Bouguereau (1825-1905). (Merle had been introduced to Bouguereau in the early 1860s by their mutual friend and early dealer Paul Durand-Ruel [1831-1922]. Later, the two would leave Durand-Ruel for Adolphe Goupil [1806-1893].) Both artists produced life-size allegorical, mythological, and historical subjects, with Merle’s, particularly after 1870, being primarily drawn from literature. Their reliance on drawing and focus on the human figure, rendered in a highly polished, academic style, were praised by numerous contemporary critics and earned them the highest professional accolades, until the rise of Impressionism and other avant-garde art movements rendered them passé. 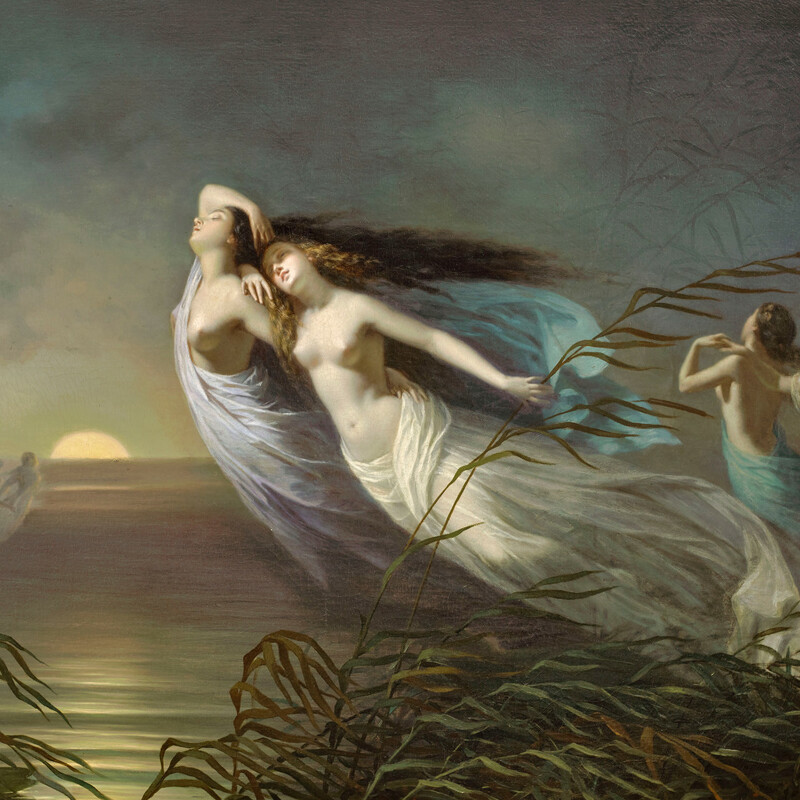 It is only in recent years that Merle’s name has been resurrected and, like Bouguereau’s, been restored to its rightful place at the pinnacle of the nineteenth-century art historical canon. Merle’s earliest pictures, produced in the 1840s and 1850s, featured rarefied historical themes envisioned on a grand and complex scale; the influence of his teacher Léon Cogniet (1794-1880), with whom he studied in Paris at the École des Beaux-Arts – along with nearly a hundred of France’s best-known mid-nineteenth-century artists – is felt in the subdued palette and emotive brushstrokes of these works. Praised by such notable critics at Théophile Gautier (1811-1872), the subjects of these pictures were characterized by Durand-Ruel as “aimable,” a term he invented to describe a whole genre of paintings that added a devout, even religious gloss to secular subject matter. Working directly with the artist and making frequent visits to his well-known studio, Durand-Ruel purchased numerous original paintings and répétitions by Merle during their early partnership. (“Repetitions” made up the majority of the picture trade during the mid-nineteenth century, with Merle’s being among the most highly prized. Gallery 19c recently acquired and sold an extraordinary répétition by the great Alexandre Cabanel [1823-1889], featuring Adam and Eve’s expulsion from the Garden of Eden.) In the 1860s, Merle adopted a jarring, high-keyed palette, and a tighter, more polished style. Compositions were simplified, distilled to their essence, and figures enlarged to fill the entire picture plane. In the final phase of his artistic evolution, Merle shifted his attention from domestic and nationalistic genre scenes to portraits and pairs of monumental literary figures, often with a romantic connection or story. After receiving second-class medals in 1861 and 1863, and in response to his flourishing reputation, Merle was made Chevalier of the Legion of Honor in 1866. “[Merle’s] pictures, as well as those of his rival Bouguereau, are so highly appreciated in Europe,” observed one contemporary critic, “ that they are generally purchased even before they are finished.” By 1879, more than fifty works by the artists could be found in American collections, demonstrating the strength of his reputation even outside of France. The American Register had reported just a few months prior that Americans had spent $3 million on French art and by 1882 it was estimated that they had spent nearly five times that amount, with record amounts being paid to Merle for his society portraits and biblical and literary subjects. Merle’s student Elizabeth Gardner (1837-1922) – also the wife of Bouguereau - estimated that that the artist made more than $10,000 a year from his increasingly international clientele, a remarkable accomplishment for a painter at this time (Elizabeth Gardner to Maria Gardner, June 10, 1873, Elizabeth Gardner Bouguereau Papers, Archives of American Art, Smithsonian Institution [AAA]). Today, Merle’s works can be found in the most prestigious museum collections in the world, including the Metropolitan Museum of Art in New York and the Louvre in Paris. Gallery 19c currently has in its inventory an extraordinary painting created in the year of Merle’s Salon debut, and exhibited at that prestigious venue one year later, in 1848. This biography was written by Emily M. Weeks, Ph.D.
 Merle would also work through independent picture agents, such as George Lucas (1824-1909), who commissioned and secured paintings on behalf of their clients. Merle’s influence on Bouguereau has arguably been underemphasized in the art historical literature; during the 1860s, the latter admittedly emulated Merle to make his work more popular: “What do you expect – you have to follow public taste, and the public only buys what it likes. That ‘s why I changed my way of painting,” (quoted in Mark Walker, William Bouguereau: 1825-1905, Montreal, 1984, p. 100). Patrons and journalists alike were regularly given entrée to Merle’s artistic space: “Merle’s studio is not far from the Luxembourg. . . . We were fortunate in finding him at home, putting the last fond finishing touches to his pictures for the coming exhibition,” (“Foreign Correspondence, Items, etc.,” The Crayon, vol. 8, no. 5, May 1861, p. 118). “Fine Arts: New Pictures by Merle and Bougeran [sic] – Sculpture – The Metropolitan Museum of Art – Academy of Design,” New York Times, May 15, 1870, p. 3. In Art Treasures of America Edward Strahan determined that there were 52 works by Merle and 74 by Bouguereau in private hands (Edward Strahan [Earl Shinn], The Art Treasures of America Being the Choicest Works of Art in the Public and Private Collections of North America, Philadelphia, 1879, index). “Merle is very little cared for by Parisians,” another critic confirmed, “[but] his pictures bring large prices for the English and American market. . . . I met -----, of New York, the other day, who has been hunting for Frères, Merles, Lemmens and other works of that character, and he informs me that they were very scarce and very dear,” (“Foreign Correspondence, Items, etc.,” The Crayon, vol. 7, no. 10, October 1, 1860, p. 296). See Susan Grant, “Whistler’s Mother was not Alone: French Government Acquisitions of American Paintings, 1871-1900,” Archives of American Art Journal, vol. 32, no. 2, 1992, pp. 3-4; and H. Barbara Weinberg, The Lure of Paris: 19th Century American Painters and Their French Teachers, New York, 1981, p. 78.